Bristol has a history of spawning bands with a message and with The Disfavoured Party it appears to have done it again. Spreading their views on a damaged society as they see it, through the medium of up front, abrupt, marchy, rock n’ roll, they bring us the latest instalment of their musical manifesto. If their sound was a guest at a party it would arrive with PiL, secretly admire Tony Hadley’s tone, drink like men with Them Crooked Vultures and get deep and meaningful at the end of the night with Maximo Park. Kicking off with drums that mean business, you are soon treated to the first of many chunky, determined guitar riffs before the staccato vocals roll out lyrics clasped in clenched fists and laden with intelligence. Not much time is spent wasting any vocal melody at all – if you like a good dose of “oohs”, “aahs” and “yeahs” you’ve come to the wrong place; sit down and listen to the story or get out. Each song is a slightly different glimpse of a dystopian mess, apparently designed by and created for those who are not “us”. Banners are waved at the establishment and pictures are painted of a slightly twisted approach to the world. Some parts sound more suited Thatcher’s Britain than the present day; its version of sticking it to the man having more to do with throwing hundred and forty-character zingers out into the twittersphere than hurling bricks at the authorities. The world’s obsession with purpose-built celebrity gets a prod as well in ‘The Secret’. Lines like “feed the dough into the press/the emphasis is on the way that you dress” and “if in doubt pretend you’re tres important” are delivered with an almost manic quirkiness, casting a weary and cynical eye over the conveyor belt of packaged and canned chart-toppers. It’s a song that could be accused of having a footing in some level of jealousy of success if the point it was making wasn’t so depressingly obvious and true. Each of the five tracks is solidly satirical and laced with thick globs of contorted humour and discontent. This is most obviously laid out in ‘Holy Father’ – a nearly operatic jab at organised religion that suggests it was composed with a certain level of irony as harmonies that are fit for a cathedral spill out over the chorus. You can imagine the faces of a shocked congregation staring back at the band, all very fitting when you look at the press releases and how they depict The Disfavoured Party as a movement more than a band – a church of the people built under the combined ethos of the holy trinity of Bragg, Strummer and Lydon. Aggro be thy name, amen. 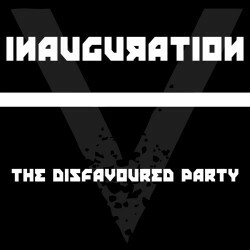 ‘Inauguration’ may not be everyone’s cup of tea. It’s true, at times the style of the music can sound almost like a parody of itself, as if The Mighty Boosh had decided to go a bit more punk. However, given the frequently witty tone of the lyrics, I’m not sure that this is entirely unintentional. On the EP’s closer, ‘One of Many’, it’s safe to say this Julian Barratt-style warbling reaches the height of its power before crashing into the final podium-pounding call to arms, and it is at this moment that the smile perhaps falls a little, allowing a serious message to edge into focus. As a musical representation of a city goes it is bang on – not a single, solitary Tory politician or branch of Tescos is safe when those West Country lefties get their blood up – and as a fine display of refreshing and substantial song writing goes it’s pretty good as well. Bands don’t always have to have a “message” and in fact it can be pretty irritating at times when they do, but when they get it right it’s a valuable addition to the world of sound. So, to you, dear reader, I say give The Disfavoured Party a go and to The Disfavoured Party I say bring on the next sermon…we’re ready.